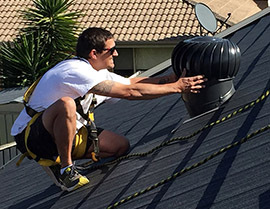 Roofing Revival is a family owned and operated company situated in The Hills District, with over a decade in the industry, we pride ourselves on providing quality workmanship, with a professional approach to every job undertaken. All jobs are quoted and completed by Matt, the owner of the company, so you know what you’re getting with no hidden surprises. We use only the best quality products on the market and are able to keep costs to a minimum as we don’t have massive over heads. From jobs as little as tile replacement to full gutter replacement or a full roof restoration, no job is too big or too small for Roofing Revival. Call us on 0450 545 433 for a free quote. Do you require a roof restoration or roof repair and live within Parramatta? Well, you've come to the right place because we're your local expert! Whether you have purchased a new home or a pre-existing home, every house needs their roof maintained to ensure the tiles or roof material do not weather over time and become weak or brittle causing leaks or damage. In other words, you want to ensure you've got the best protection over your head, minimising any risk of damage to rooms inside your home. This is why provide the best, high quality, low cost, diligent roof restoration & roof repair for roofing Parramatta. Repairing or replacement of roofs – The roof of an old building often fades off and even starts leaking, due to which it may need to be replaced. Our roofing team provides the best roof replacement or repair services at an affordable cost and are available at a time that suits you and will provide all your roofing Parramatta services. Repairs after storms – We have an efficient team that works very promptly in providing roof restoration Parramatta, in case the roof of a house is damaged due to any type of storms, saving the residents from any uncomfortable situation of living under a broken roof. Other types of repair work – A competent and professional team at Roofing Revival is not only proficient in roof repairs Parramatta, but it can be contacted for several other repairing services in a house; like fixing of your fascia. Our customers also rely on us for gutter cleaning Parramatta, which needs to be done periodically at every house. Regular maintenance of your roof – The longevity of a roof can be extended for a longer period by the effective services for roof restoration Parramatta, so that the roof can remain steady in severe weather, even if your roof is quite old in age. These maintenance services from us include a thorough clean and inspection of your roof by our expert professionals, so that any requirement of even minor roof repairs Parramattacan be treated immediately before it can extend and cause larger damage to your roof. Cleaning and repairing of gutters – Our professionals involved in gutter cleaning Parramatta will clean, repair and fix your gutters. Call us anytime for the services in Parramatta. Call 0450 545 433 and we will promptly visit you to provide you with an inspection & free quote.